Landscape Edging Ideas for Water Features - Aquascape, Inc. When it comes to designing a water feature for your yard, it’s important to naturalize its appearance so it looks like it’s been carved into the landscape for years. An easy way to make your pond blend in with the surroundings is to pay careful consideration to areas where the water meets the land. You’re sure to find inspiration from our collection of landscape edging ideas for your water feature, whether you have a pond, waterfall, or stream. When placing your pond near a patio, transition the edge with small boulders and creeping ground cover, like this backyard pond installed by The Pond Gnome of Peoria, AZ. The sedum softens and blurs the hard edges of the brick patio and creates a pretty landscape edging. Plants are always a good choice when considering how to edge your pond. Coneflowers are planted in the dirt just outside of the pond, while aquatic Purple Pickerel is planted along the margins inside the pond. The pairing makes it difficult to find the true edge of the pond, thereby creating a natural look. Bring annuals up close to the edges of a stream or waterfall to help soften the rocks and edges of the water feature. Impatiens are a great choice because they mound and cascade. Plus, they like to get their feet wet and are a perfect choice for planting near a water feature. Outcroppings are one of the most popular ways to enhance the landscape edging of a water feature. Flat rocks appear to be floating just over the water and create interactive spots. Children can play in the water while sitting on one of the large flat stones. Create a rocky shoreline with a mix of small and medium-sized rocks. Extend the pebbles into the bottom of the stream for a truly natural waterfall appearance. The family dog enjoys the pebble beach of this Florida pond and waterfall. The soft, flat pebbles allow an easy entry point into the pond where the family can explore nature. The pebble beach looks like it’s always been part of the landscape even though the water feature is just a few years old. Rocks and plants naturalize the landscape edging of the northwest side of this pretty backyard pond. A cantilevered deck hugs the southwest side and provides a place for the owners to dangle their feet and enjoy viewing the fish. Soften edges of a water feature with mulch and mounding miniature evergreens. A larger evergreen creates an architectural background for this backyard pond and waterfall. You’ll find a variety of ways to improve the landscape edging of your water feature. 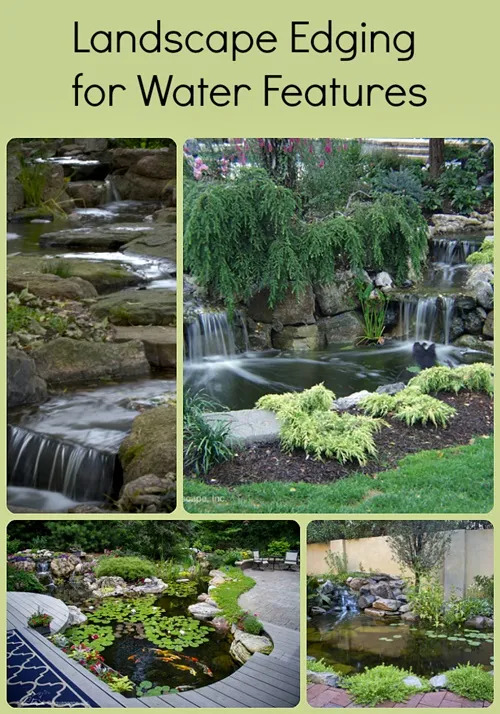 Many can be achieved even after your pond or waterfall has been installed.